When you picture the kitchens for big companies, companies that test out recipes for books and magazines, or companies that develop packaged baking products, you probably picture a huge professional kitchen: stainless steel everywhere, convection ovens, huge noisy hoods over the cooktops and people in white chefs’ coats. This might be the atmosphere at some test kitchens, but not at the Betty Crocker Test Kitchens, which are some of the busiest kitchens in the country. The test kitchens have been around since 1921, developing recipes for home cooks. Today, not only do they develop recipes there, but they extensively test the various packaged products produced by General Mills that come out under the Betty Crocker name (they test other GM products there, as well). Along with Cooking with Amy, Cookie Madness, Bakerella and Picky Palate, I was able to take a little behind the scenes tour of the test kitchens last week at an event hosted by General Mills called the Eat n’ Greet. The kitchens are just that – multiple kitchen setups in one very large and well lit room. There are 19 complete kitchens and over 7,000-square feet of space. Having 19 kitchens means that there are actually 19 cooktops, but there are actually 50 ovens in the space. I can’t imagine even trying to fill that many ovens, although there are days when it certainly would be nice to have access to that many at once! More than 2,000 recipes are developed for various publications, packaging and the web every year. The facility is a new one, so it’s not surprising that everything looks sparkling clean. Despite the huge size of the kitchens, only about a dozen people work down there on a regular basis. I suspect that lots of people manage to wander by for snacks during the day. The kitchens are set up like home kitchens because all the recipes developed here are for home bakers in home kitchens, not professional chefs. Even though those who work in the kitchen are pros, they try to keep everything to the same equipment and same circumstances that we might find in our own kitchens to ensure that the recipes work when you’re dealing with regular ovens and regular pans. Incidentally, Betty Crocker was not a real person, but actually an amalgam of many home economists’ knowledge and experience. She was created in 1921 to answer various home baking questions submitted to the company by Gold Medal Flour users during a contest. She’s been here ever since. The group we were a part of consisted of 50 bloggers – both food bloggers and mommy-bloggers from around the country. On our tour, we were able to check out all the aspects of the test kitchen, meet some of the staff who worked there and sample some of the new products that General Mills is currently developing. Some of the new products included cereals, granolas, lots of 100 calorie yogurts, Progresso soups and some bruschetta made with Muir Glen tomoatoes. 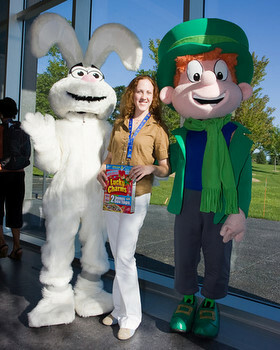 We also had an opportunity to take photos with some of the General Mills mascots, like Lucky the Leprachaun and Trix the Rabbit, above. While the product samples were interesting, the most interesting part of the tour was just getting to see how the kitchen was put together. All the pantries were stocked with various ingredients -scratch ingredients as well as boxed mixes for existing General Mills products – and the drawers had pots, pans, parchment paper and just about every other piece of kitchen equipment that you might need. None of the in-development products were being tested while we were there, but we were able to sneak a peek at some holiday snowmen who were sitting in one of the fridges, awaiting their chance to be a part of a seasonal recipe or some holiday packaging. From the kitchens, we moved on to the General Mills photo studios. Does anyone know how to go about getting a tour of the Betty Crocker Test Kitchens? I am a culinary student at Texarkana College in Texarkana, Texas. This is my 3rd quarter, next quarter I have to do my externship, I would love the oppertunity to learn in your kitchen. I have tried to locate a web site for this and couldn’t find one.Please consider my request. My extern starts May 26 2010. Hi Nicole, I love that the blueberry muffin mix in the box, (18.25 oz) has a recipe for quick bread. But how many of the 6.25 oz pouches will it take to make that same blueberry quick bread turn out right? The math tells me 2.80 but what will that be in cup amounts. If I go with three pouches I’m at 19.5 oz. oz. will it make any difference? Should I increase the amnt. of liquid ? Love the site, Thanx, T.S. TS – Mix up the batter with three of the small packets, then fill up your loaf pan to about 2/3 or 3/4 full. You will probably waste a small amount of batter this way (you could always pour it off into a couple of extra muffin cups), but it’s the easiest way to get the right volume for your pan.